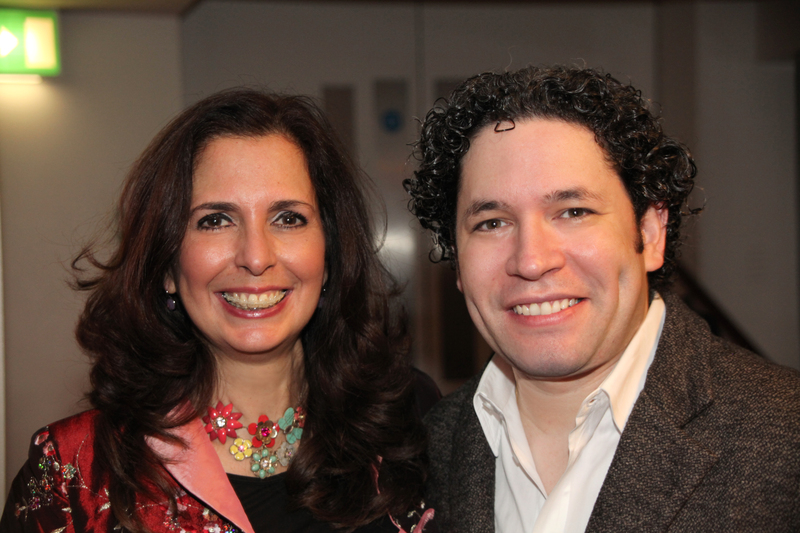 On the 8th and 9th of January 2015 I had the opportunity of listening to the Simón Bolívar Orchestra conducted by Gustavo Dudamel at the Royal Festival Hall on two different programmes containing Beethoven 5th Symphony, Wagner’s Entry of the Gods into Valhalla from Das Rheingold, Siegfried’s Rhine Journey from Gotterdammerung, Siegfried’s Death and Funeral Music from Gotterdammerung, Forest Murmurs from Siegfried, Ride of the Valkyries from Die Walküre and as encore Liebestod from Tristan und Isolde.For the second programme they played Julian Orbón’s 3 Versiones sinfónicas and Gustav Mahler’s Symphony No.5. I also could make it to the two rehearsals and I am writing this little note to make sure I never forget what a beautiful musical moments I lived in those circumstances, listening to nearly 200 Venezuelan musicians perform under the marvellous baton of Gustavo Dudamel. There was a deep search technically and spiritually in order to reach all these scores have to offer but also deep psychological search into the whole panoply of human feelings, sentiments, struggles, imagination, fulfilment. One could see developing before one’s eyes and ears the fragility of our universe next to the greatest power of our minds and physical might; beauty and many kinds of love were also expressed in those rehearsals and in the evenings in front of 5.000 people that gave standing ovations in recognition that something profoundly human had just been unfolded and unveiled in that concert hall. Lots of thought has gone into creating the music performed of course but also forming each of those fantastic musicians who obviously have the greatest desire to do their art well and sharing it with the world. In the second rehearsal I have to admit that tears were flowing down my cheeks just listening to the Mahler famous Adagietto, there was a sadness in all of us, so many things are going wrong in the world, around us and near to our hearts that it was impossible not to give in before so much concentration and beauty. It really was a feast that has inspired me a lot, so much that I do not feel this winter’s cold weather! 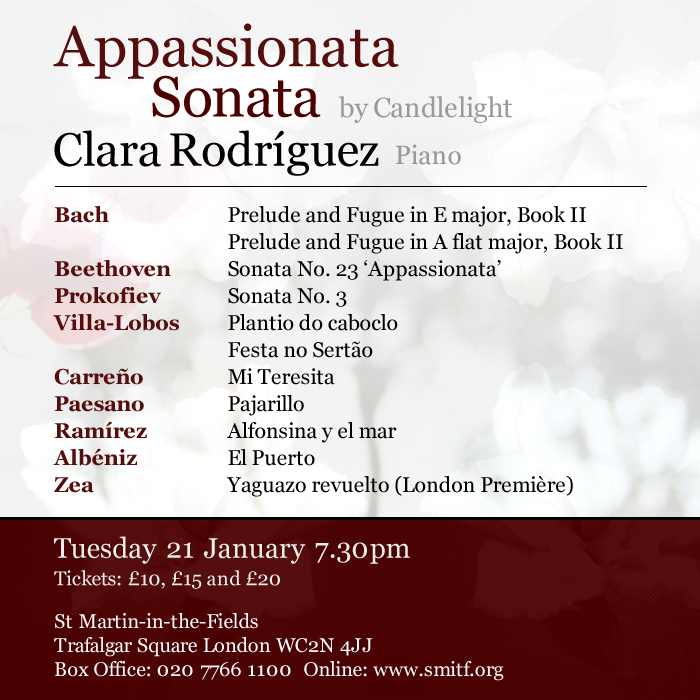 Clara Rodriguez will be playing a very special concert in the beautiful Saint Martin-in-the-Fields -Trafalgar Square, the heart of London. 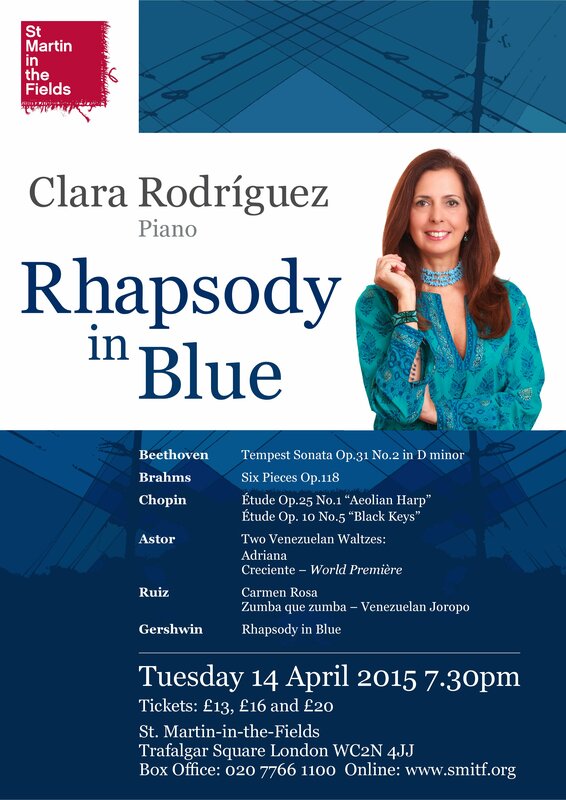 A fascinating and passionate programme of immense works. Starting by two preludes and fugues from the Book II of the Well Tempered Clavier by JS Bach followed by the Appassionata Sonata that was considered by Beethoven to be one of his most tempestuous piano works. 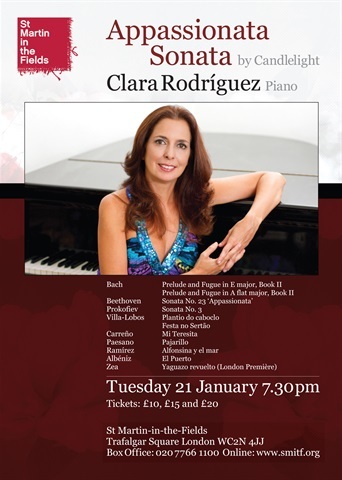 After another energetic and virtuoso sonata such as Prokofieff 3rd I shall perform two pieces from the Brazilian Cycle by Heitor Villa-Lobos, works by Venezuelan lady- composers such as Teresa Carreño and Luisa Elena Paesano, El Puerto from the Suite Iberia by Isaac Albéniz, a version of the nostalgic Argentinean song Alfonsina y el mar and a London Première by guitarrist and composer Luis Zea based on a traditional Joropo form called Yaguazo en contrapunto, a kaleidoscopic piece of enchanting rhythms, accents and surprising harmonies.